Recommended For: Fans of Patricia C. Wrede, dragons, and happy endings. Far away on Wilde Island, Princess Rosalind is born with a dragon claw where her ring finger should be. To hide the secret, the Queen forces her to wear gloves at all times until a cure can be found, so Rosalind can fulfill the prophecy to restore the family to their rightful throne. But Rosalind’s flaw cannot be separated from her fate. When she is carried off by the dragon, everything she thought she knew falls apart. The dragon sees beauty in her talon where her mother saw only shame, and Rosalind finally understands what her mother has truly denied her. 600 years ago Evaine, the sister of King Arthur marries someone her family believes to be beneath her status, due to her choice to marry for love she is exiled from the kingdom forever and flees to Wilde Island. Merlin has a prophecy that the 21st princess of Wilde Island will restore the name of Pendragon and end the war between humans and dragons. Princess Rosalind feels the pressure of this prophecy in present day as she lives with a terrible secret. Rosalind was born with a dragon claw in place of her ring finger on her left hand. The only people who know of this deformity are Rosalind, her mother, and an old witch who lives in the mountains. Rosalind wears gloves every moment of every day to hide her “curse” and she waits for the day she will meet and hopefully marry Prince Henry. Soon after a convoy from the Queen of England comes to judge Rosalind on behalf of the Queen and Prince Henry, Rosalind is abducted by a dragon and taken to his keep. Rosalind is forced to live with this dragon and take care of his four offspring. The story unfolds as Rosalind learns what it means to be both dragon and human and how to rule as queen to both. I picked this book up after I read Janet Lee Carey’s newest book, Dragonswood. Dragonswood is a companion novel to Dragon’s Keep and I thought it would be a good idea to find out the premise behind the second book. 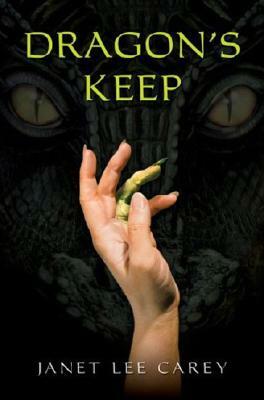 I really enjoyed this book; I kinda love dragons a lot and have been hooked on them ever since I read Patricia C. Wrede’s Dealing With Dragons as a child. The dragons in this book are a little different than Wrede’s but they were endearing nonetheless. This wasn’t completely a happy fairy tale. There were some dark moments and I found myself really feeling the anguish Rosalind felt over her relationship with her mother. I felt like the romance of this book could have been left out, it seemed extremely rushed and contained no depth for me. It wasn’t the typical “love at first sight” that I have been finding in YA novels lately but Rosalind starts longing and needing this guy rather quickly to the point where upon seeing him for maybe the 6th time they are ready to get married. I thought it was very sweet but I couldn’t help but think that she was in love with the guy because he appreciated and understood her like her mother never could. I enjoyed this book a lot, though not as much as its companion novel, Dragonswood, which I will be reviewing this weekend so make sure you stop by! I recommend it to fans of Patricia C. Wrede, dragons, and happy endings. “She shall redeem the name Pendragon. End war with the wave of her hand. This entry was posted in Reviews, Young-Adult and tagged dragons, fantasy, magic. Bookmark the permalink. Sounds like my kind of book! Adding it to the list!Thanks for the great review! It was a good book, the companion novel is even better and I will have a review up for it tomorrow morning so make sure to stop by! I really want to read this one! Okay, I REALLY want to read Dragonswood, but I'll read this one first so that I have more of a background on it. It sounds like a really cool story, I like the relation to King Arthur. Good to know not to expect an amazing romance going in, but I'm still excited!